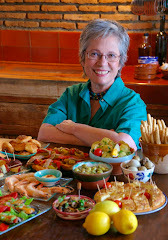 MY KITCHEN IN SPAIN: BREAK OUT THE BUBBLY! Get ready for New Year’s Eve! Pop open a bottle of bubbly and get your twelve grapes in hand. At midnight, you eat a grape on each stroke of the bells, to assure a year of good fortune ahead. 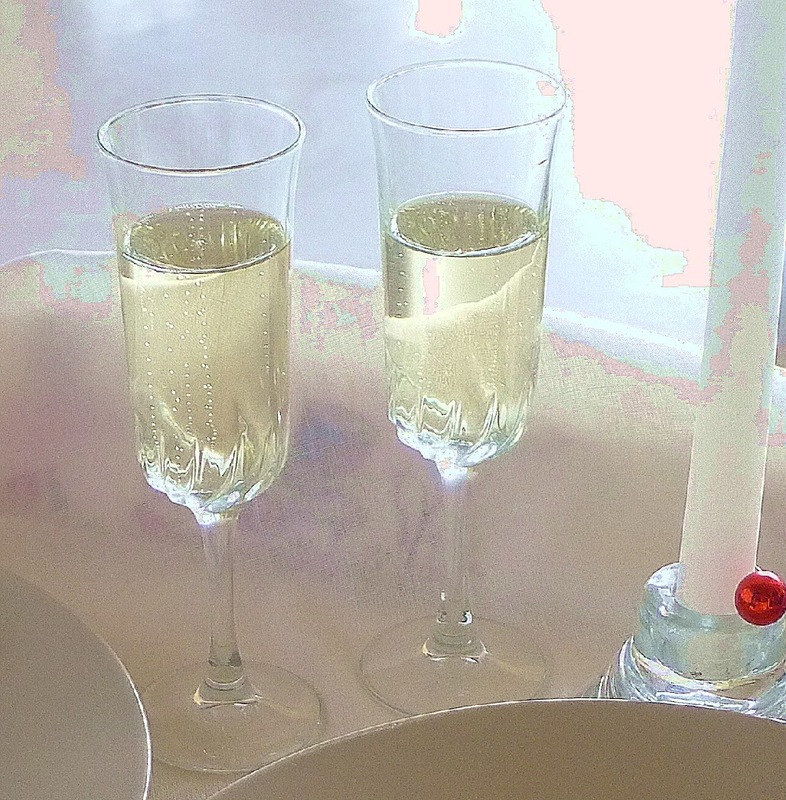 Pour the festive cava and proffer a toast to future sparkles. A sparkling dish for New Year's Eve--roasted salmon with cava sauce and grapes. 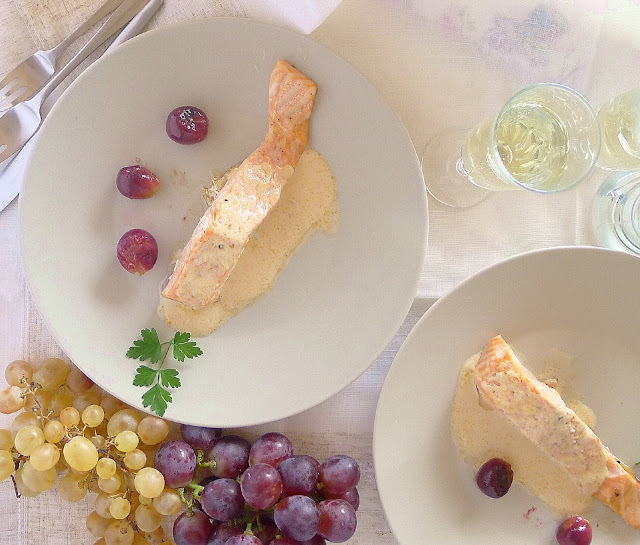 Make this recipe for salmon with cava sauce and grapes and you’ll have a good excuse to open the bubbly way before midnight! You’ll need less than a cup of cava for the sauce—the rest is for sipping with dinner. Cava is Spanish sparkling wine. What is cava? Cava is the official denominación de origen (DO) label for Spanish sparkling wine made by the same process as Champagne. 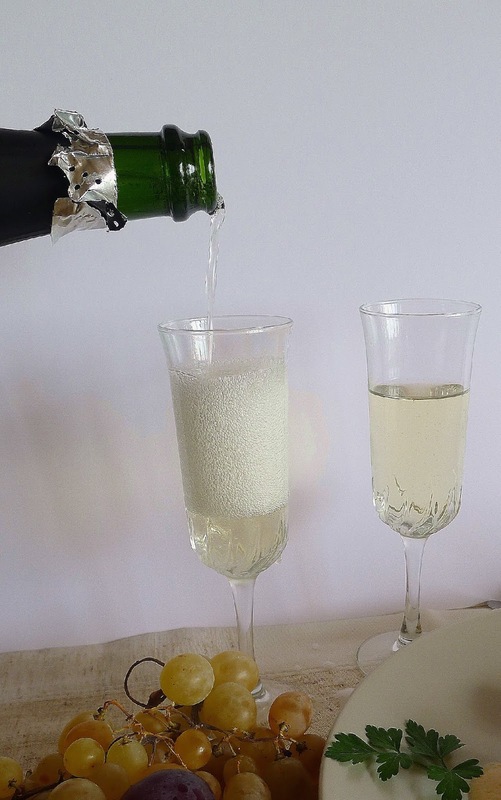 No, don’t call it “champagne” or “champán,” because Champagne is a region of France and the wine made there has its official denomination. 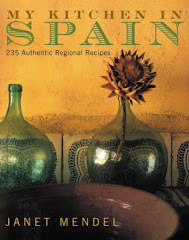 The word “cava” comes from the Catalan word for “cellar.” Most cava—but not all—comes from Catalonia (85 percent), in particular, the Penedes region. Carbonated wine—vino espumoso—is not cava and does not have DO. Cava ranges from extremely dry, with virtually no residual sugars—brut nature—to semi-sec, or “medium-dry,” which is actually medium-sweet. 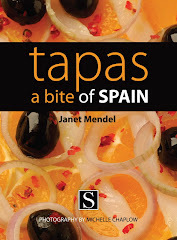 Serve dry cava with tapas, with soup and with seafood and poultry entrées. Serve the sweeter ones with dessert—especially with turrón, almond nougat candy, after a holiday meal. The salmon fillets can be poached, pan-fried or roasted. I like the quick and easy roasting method—once the oven is up to 500ºF, the fish needs only six to eight minutes to cook. Be sure to have dinner plates heated. Lift salmon out of the pan onto plates and spoon the hot sauce over. Vinalopó grapes, uvas de la suerte. Adding grapes to the sauce is one way to ingest your uvas de la suerte—midnight’s twelve grapes of good luck. 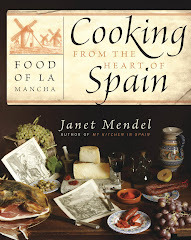 I’ve used both golden Vinalopó grapes and red ones. 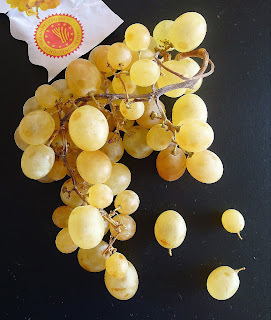 The Vinalopó grapes (DO Uva de Mesa Embolsada de Vinalopó) come from Alicante province, where they are grown enclosed in paper bags that protect them from insects, birds and burning sun. Maturing slowly, the protected grapes ripen in time for the winter holidays. It’s estimated that about 2 million kilograms of these grapes will be consumed on New Year’s Eve! Allow about 6 ounces of salmon per person. The fillets should be approximately 1 inch thick. The recipe makes enough sauce for 4 servings. Sprinkle the fillets of salmon with salt and pepper. Allow them to come to room temperature. 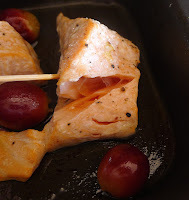 Lightly oil a rimmed baking sheet and place the salmon on it. Drizzle additional oil over the fillets. 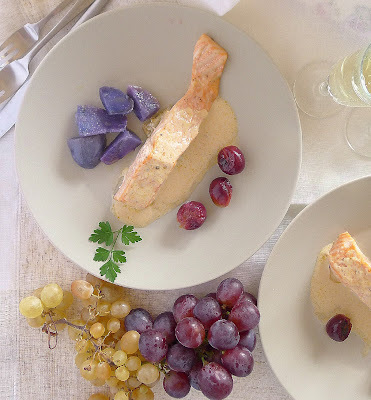 Place a few grapes (2 or 3 per fillet) around the salmon. 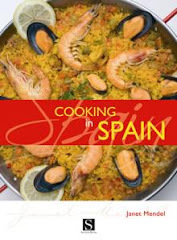 Heat 1 tablespoon of oil in a saucepan and sauté the shallots for 3 minutes. Do not let them brown. 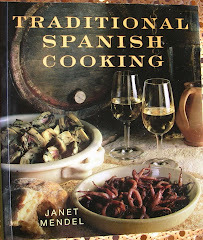 Add the shrimp or fish stock and the cava. Bring to a boil and simmer 10 minutes, until the liquid is reduced by half. Add the cream to the saucepan. Bring to a boil and simmer the sauce until it is somewhat thickened, about 5 minutes. Add the grapes to the pan and keep the sauce warm. Place the salmon in the oven and roast until the flesh separates easily when probed with a skewer, 6 to 8 minutes. Thinner fillets will take less time than thick-cut pieces. Place the fillets and roasted grapes on heated dinner plates. 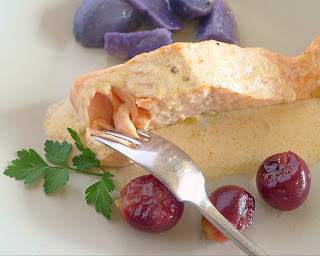 Spoon the sauce with some of the peeled grapes over the salmon. 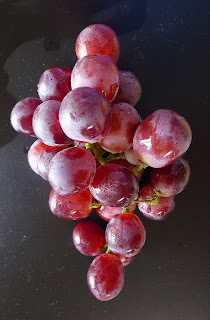 Fat red grapes are great for roasting--but too big to be swallowed on the 12 strokes of midnight. Here’s to a sparkling New Year! Feliz año nuevo! Black-Eyed Peas with Tomato Sofrito. Pears in Cava with Fresh Cheese. Consommé with Quail and Wild Mushrooms. Duck Breast with Clementine Sauce.